In Part I of this post, I shared with you some often overlooked considerations when embarking on a big purchase: the new deck. So here for your enjoyment are 3 more massively important deck design considerations that you must think about before this major home renovation. Here’s the rest of our top 5 list of protections and considerations. In Part I, when I discussed the costs of wood versus plastic, I mentioned a hard but costly wood called Epay, but the mixed materials example I’m about to give can work with any wood. On the topic of mixing materials on your deck, I had a client use epay for the floor boards and run a contrasting black railing system done in plastic decking materials. It’s a sharp look and he was pleased to eliminate the need for annual maintenance to at least the hand rail, posts and endless spindles. So if you had your heart set on a maintenance free plastic composite deck, but the numbers got too high, you can consider this mixed railing and floor board option. You’ll still be sealing/staining your floor boards, but eliminating the railing system from that chore will help ease the task. A word of note about the need for mixed materials on pergolas: If you are a pergola lover as I am, please note that these CANNOT be built with plastic decking material as it lacks structural strength. The way this is handled on your plastic composite deck is to cover your wood posts in plastic sleeves however the boards that run across the top of the pergola have to be wood. The aesthetic way around this is to have the wood board slats of the pergola stained to match the composite decking material uses. And in my case, plant Wisteria or other vining plants to grow over and cover those wood boards….delish! These can be reused whether you are redoing your deck in wood or plastic composite. Because they’ve been largely shielded from UV light and the elements, they are generally usable….unless there was a water issue or termite attack. This absolutely will help lower costs. Not all builders are willing to do this however so check with yours. Gone are the days of the requisite single color deck. Particularly in plastic decking material, you can do the edge in a contrasting border around . This smart look is also a great devise to signal changes in elevation or transition to stairs. Handrails can also be in a contrasting color. The beauty here is a wonderfully custom looking end product in which the color contrasting doesn’t add any cost! 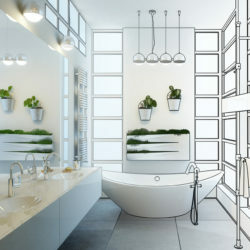 It’s the lighting options that add cost but you can forgo these without missing them. 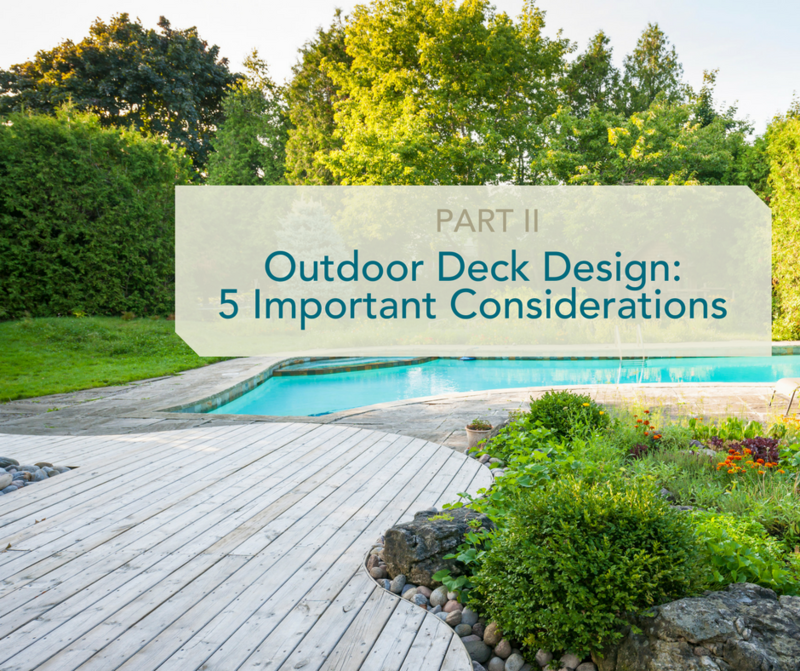 Here’s your most important caution on the design side of your outdoor deck: Be wise and invest in having a skilled designer space plan your “proposed new deck” BEFORE YOU BUILD NEW. She can make sure you have the depth and width needed to layout the furniture you own or want so that it fits and supports desired and optimal deck use. I’ve seen too many disappointed deck owners who discovered “after the fact” that their deck was too narrow or too long and thus won’t work as they’d hoped originally. Sometimes something as little as 6” in either direction can make or break things. SO….all hands “on deck!” Enjoy your new – or newly redone – outdoor living space!